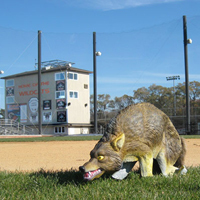 The Flock Reflector is a simple, inexpensive and durable option to provide bird control for a 50' area around where it is deployed (2,500 square feet). 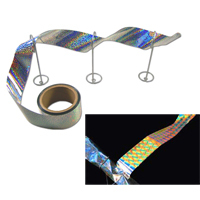 It is environmentally friendly as the movement is generated by harnessing the wind (moving the reflectors) and the deterrent effect of bright flashes is provide by the sun. The three parabolic cups move in even the lightest breeze, spinning around the central axis. As they spin, the curved surfaces catch, focus and reflect the sunlight, sending out blinding flashes of light which disorient and irritate birds. The unit is composed of aluminum and plastic and is weatherproof. The included mounting plate has 4 holes which can be used to mount this device in any orientation. 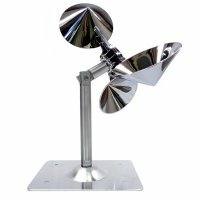 Recommended for any area with access to light &/or wind. The top can be tilted 90 degrees to accommodate vertical or angled areas. The Laser for Indoors is an innovative product which provides silent, humane indoor bird control with the ease of a remote. 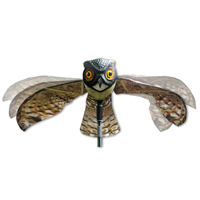 This visual deterrent flashes red and green laser patterns in combinations that birds hate, strongly discouraging birds from resting or roosting in the vicinity. The bright red and green colors are alarming to birds, and constantly change shape randomly so birds can't acclimate to them. 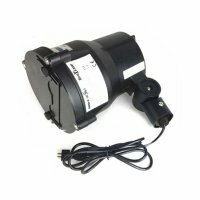 This unit is recommended for large indoor or semi-enclosed areas up to 10,000 square feet and is controlled by a simple remote. 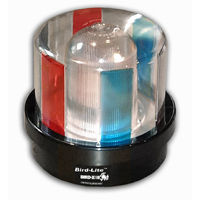 Bird-X Laser Bird Repeller uses Class 3R “fat beam” laser diodes featuring strong 50 - 100 milliwatt (mW) beams in two colours: green and red, combined in a multicolour pattern. These colours are shown to be the most effective against pest birds. The beams create multiple patterns occurring in random order. 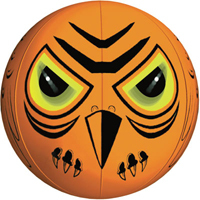 It is suitable for use both day and night; however it is more visible in the dark, in a more-enclosed area where it can bounce off walls, as well as where the beams are not blocked by large objects. 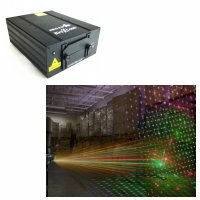 This laser beam has a maximum range of 1000 feet/300 meters in the dark. Maximum coverage is approximately 10,000 square feet. Keep in mind that this is unidirectional coverage, with beams emanating from the aperture in the shape of a slice of pie. Angle of spread = 30 degrees maximum. The Laser for Outdoors is an innovative product which provides silent, humane outdoor bird control with the ease of a remote. 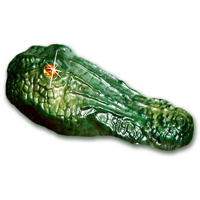 This visual deterrent flashes red and green laser patterns in combinations that birds hate, strongly discouraging birds from resting or roosting in the vicinity. The bright red and green colors are alarming to birds, and constantly change shape randomly so birds can't acclimate to them. This unit provides effective coverage up to 10,000 square feet (the maximum range is 1000 feet in the dark) and is controlled by a simple remote. The standard model comes with a mounting assembly to allow vertical and horizontal mounting using 2 screws. 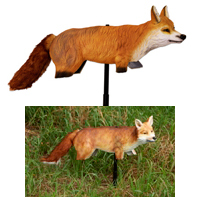 There is also a model which includes a ground spike mount to allow it to mount to the ground - NOTE: Do not mount on vertical or diagonal surfaces..